InspecTools has joined PrecisionHawk, adding machine-learning-based analytics to the company’s growing portfolio of drone-based solutions. What shape are your blades in? We've taken inspection productivity, accuracy & safety to new levels. Our purpose-built aerial platform & cloud software save time & money! Our novel infra-red aerial inspection systems find problems fast & at low cost. Asset risk mitigation is our specialty. We deliver the information you need. We design & deploy systems that acquire the right data to meet customer needs. Using technologies like custom UAVs & exotic sensors, we solve problems efficiently & thoroughly. We tailor our tools to produce the results our customers need, reducing time-consuming, error-prone processes, and delivering accurate, actionable information. Our web & mobile information tools are used to collect, organize, analyze, report & archive data. They are tailored to customer needs & integrate with their existing systems. InspecTools has proven the effectiveness of performing visual blade inspections using our purpose-built aerial platform. It is a quick, safe way to get a close view of potential damage to determine where further inspection or repair is needed. We've taken inspection productivity, accuracy & safety to new levels. InspecTools’ novel infrared (IR) inspection methods enable solar energy producers to understand the condition of their assets quickly & inexpensively. Aerial data, along with sophisticated data processing & mapping techniques, reduce time & cost of inspection, while increasing accuracy & confidence. Plus, data can be archived & compared to future inspection results to determine how assets are aging and which need frequent monitoring. 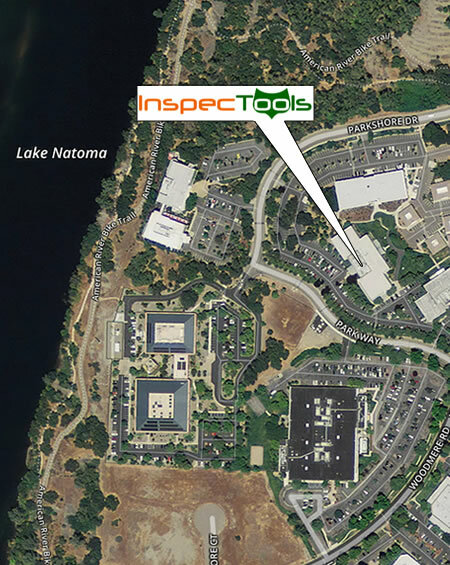 InspecTools creates valuable datasets using high-resolution aerial imagery & photogrammetry, LiDAR, NDVI analysis, geo-location, machine vision, and manned & unmanned aircraft. The information our systems deliver serves our customers over time, enabling forecasting & prediction of maintenance requirements. Our customers realize better returns on their investment in inspection & sleep better. InspecTools were able to acquire data we've never had access to before. The creative hardware solutions, expert insight and intuitive software enabled huge cost savings in our routine operations. Regular, cost-effective inspection reduces the likelihood of catastrophic failure, saves money over time, and increases your return on inspection investment, what we call your Inspection Quotient™, or IQ. We are committed to creating inspection systems that raise our customers’ IQ. Our creative integration of new & proven technologies has consistently saved our customers money, time, and worry, by delivering information they can trust and rely on for sound decision-making. Our passion for helping you preserve your assets is sure to increase your IQ, and decrease your maintenance & repair costs over time.